MedImmune’s facility in Gaithersburg, Maryland, is now certified to the U.S. Department of Energy’s (DOE’s) Superior Energy Performance™ (SEP) program and to ISO 50001. The facility improved its energy performance by 8.5% over three years to achieve SEP certification at the Silver level. 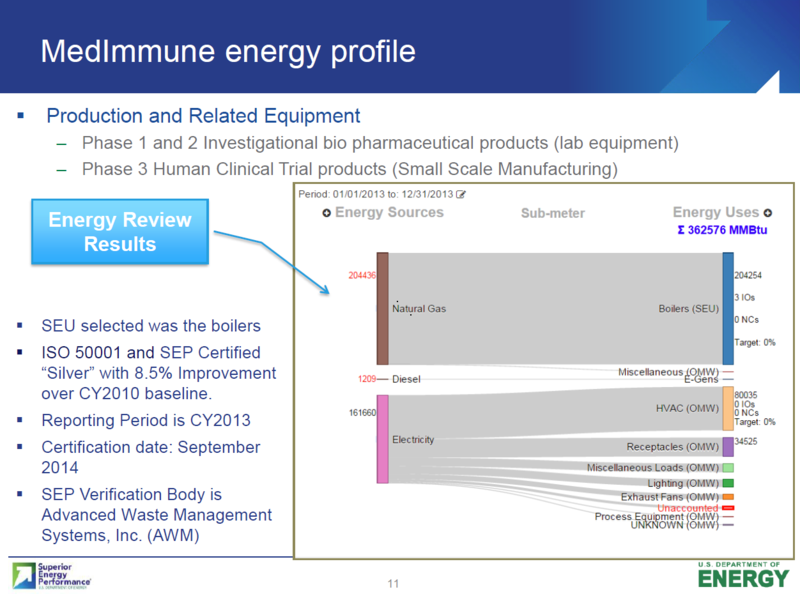 MedImmune, the global biologics research and development arm of AstraZeneca, is the first biotech research laboratory and clinical trial manufacturer to earn certification to SEP.
To qualify for SEP, MedImmune set up a robust energy management system, tracked the improvements in its energy performance, and had the results independently verified by Advanced Waste Management Services, an accredited SEP Verification Body. Certification to the ISO 50001 standard for energy management systems is an integral part of the SEP certification process. Enerit ISO 50001 software has been instrumental in the development of the Energy Management System, necessary to achieve SEP objectives, targets and other deliverables. The US Department of Energy case study provides more information. Click here to view a webinar about this case study from the US Department of Energy.